In the interests of disclosure, I should probably mention that I used to play with Fjord Rowboat guitarist Justin Grant in Bluescreen. And though I’ve seen them live a few times and enjoyed their self-released 2-song EP, I have to say I’m quite surprised and impressed with their debut full-length effort. Though never ashamed to wear their shoegazing influences on their sleeves, Fjord have managed to balance the classic dreaminess and atmospherics of the genre with an urgency and propulsiveness that’s very now. The opening one-two punch of “Carried Away” and “Can’t See The Sun”, in particular, pulse with a Bloc Party-like energy that’s invigorating when blended with the chiming guitars and moody vocals. Elsewhere on the album nods are made to forebears like Swervedriver, Ride and Chapterhouse but the overall vibe is very contemporary. Recommended to anyone looking for proof that shoegazing doesn’t have to be synonymous with nostalgia. 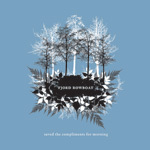 Fjord Rowboat play a CD release party for Saved The Compliments For Morning at the El Mocambo this Friday, February 23 with Raised By Swans and The Hoa Hoas. 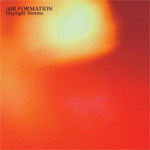 Also looking to prove there’s still fresh inspiration to be found in one’s sneakers are Brighton UK’s Air Formation and they choose a more circuitous route, adding some post-rock cues into the mix. Aspiring for an epic, widescreen sound they utilize more drawn-out song structures and stately atmospherics in their craft. But for all the sturm und drang they offer, the languid vocals, vauge lyrics and blankets of reverb and delay create a sense of distance and detachment that’s symptomatic of shoegazing bands that get too caught up in their pedalboards. The net effect of which is like watching a thunderstorm through a window – it all looks (or in this case sounds) very impressive but comes off a bit too safe. Sometimes you need to feel the rain. Fjord Rowboat is excellent, thanks for the intro!